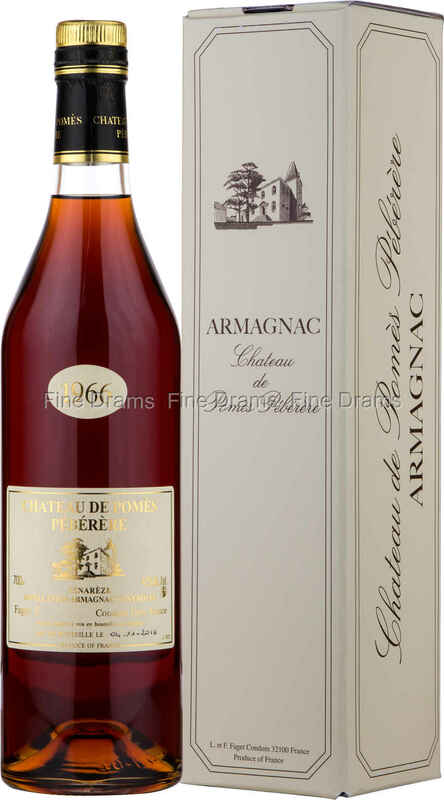 Chateau de Pomes Peberere are a small scale distillery and wine-producer in the south-western French area of Gers. Since 1820, the Faget family have tended this ancient vineyard, which is planted on a west-facing sun-drenched plateau surrounding the 15th century Gascon castle. The soil here is rocky and rich with iron and limestone, perfect for producing a flavoursome Armagnac grape. Here the Domaine grows its Ugni-Blanc and Colombard grapes, both excellent choices for Armagnac production. Unlike many other spirit makers in the region, Chateau de Pomes Peberere maintain a permeant distillery, though they only use it for few weeks each year. The Domaine is also renown for its top-quality, single-year vintage releases, which have matured in the depths of the Chateau’s cellars in 400 litre French oak casks. This particular bottling is no exception. A rich and complex spirit, the extraordinary age of which has granted superb balance. On the nose a perfumed prune note greets the drinker, before a chewy, oaky palate takes hold. The finish is long and satisfying, with woodnote flavours accompanied by a sweet grape note.